Stefano Domenicali: "After positive results in Belgium, Monza and Singapore, there's no use denying that today's result doesn't make us happy. We were hoping to be able to attack the two Mercedes on the opening lap, as we knew we could deal with their race pace. Unfortunately, that was not the case and the incidents just after the start affected our race, wiping out any chance of getting close to the podium. In these conditions we didn't manage to get the most out of our car and now the only thing we can do is keep our concentration high for the next round in Japan, where we get an immediate chance to redeem ourselves. Even if the Drivers' title is now an almost impossible target, we still have an obligation to continue to give our all to the very end of the Championship, because we are still fighting for second place in the Constructors' Championship". Fernando Alonso: "We knew this would be a difficult race and unfortunately the results confirmed the concerns we had already experienced on Friday, when we had a few problems with tyre degradation on the long run. It wasn't a surprise to be off the pace in qualifying, as that's been the case since the start of the season, but the fact that we didn't have the pace in the race was one. Unfortunately, at the start, I couldn't keep the Sauber behind me and that meant I had a particularly stressful race in terms of the tyres. What happened to Felipe at the third corner was not a problem for me: there were a lot of us there at that point and someone must have touched him. I tried to avoid him and continued without it affecting my race, because by then, I was already behind Hulkenberg. Now we must think only about Suzuka and try to get back on the podium, rediscovering the form we usually have on Sunday, that allows us to fight at the front. 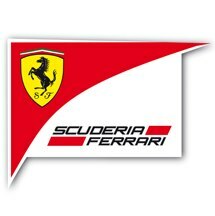 Vettel is a very long way off in terms of points, but above all in performance terms and we cannot expect miracles between now and the end of the championship. Second place in the Constructors' championship is probably a more realistic target, but one thing's certain, we are not giving up now and we will give it our best shot right to the very end". Felipe Massa: "Today's race was really very complicated, because my chances of getting a good result evaporated right from the first lap, when I found myself in the middle of a group, all of us fighting and I decided to go down the inside to try and brake later. Unfortunately, some of the cars were slower and in order to avoid driving into one of the Mercedes, I was forced to move over to the right, ending up in a spin. Luckily, the car was alright, but at that point I was contemplating a race from the back of the pack. Thanks to a few nice passing moves I still managed to bring home some points, which was a good thing compared to how it looked after the start. Today, we weren't competitive and there were at least three or four teams quicker than us, including Sauber, but I hope this was mainly track dependent and that our car will be better suited to the Suzuka track". Pat Fry: "Today the top places were out of reach, in what was a very tense race for both our drivers, caught in traffic behind the Saubers from start to finish. On this track, their two cars were able to make the most of better traction on the exit to the corners and their high top speed made life difficult when trying to overtake them. At the start, Fernando managed to close on Rosberg at the first corner, but had to back off so as not to go off the track, which helped Hulkenberg get past on the straight. Once he was behind, he had to deal with tyre wear and it was a real shame, because our pace was not lower than that of the Mercedes. As for Felipe however, the spin going into Turn 3 dropped him to the back. On lap 15, after a climb up the order that took him to fourteenth place, he found himself behind Gutierrez. Both Fernando and Felipe did their utmost and fought hard all weekend against tyre degradation and graining, which was particularly high, because of the characteristics of this track. For Suzuka, we will try and improve and get back to aiming for a podium finish, because we certainly don't want to be fighting for sixth and ninth".